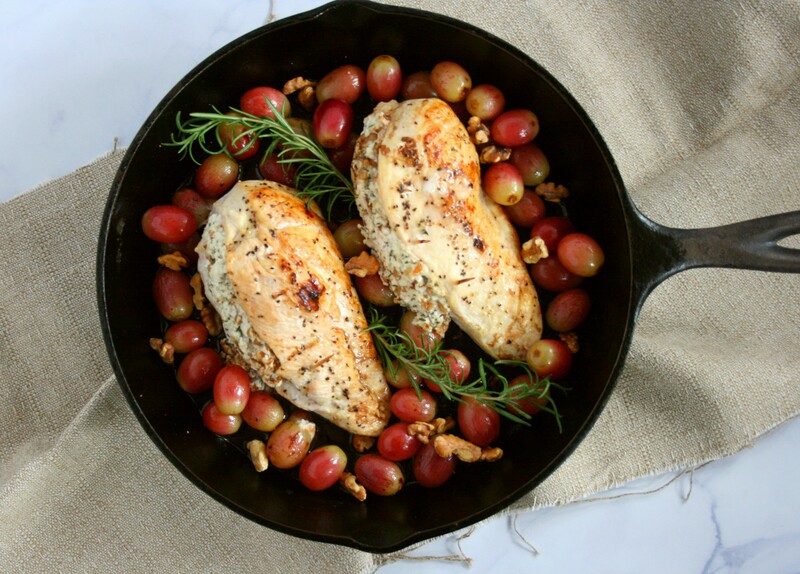 Spice up your normal dinner routine with this Stuffed Chicken Breast with Grapes, Goat Cheese, and Walnuts recipe. In just under 40 minutes, this simple, but elegant entrée is table ready. 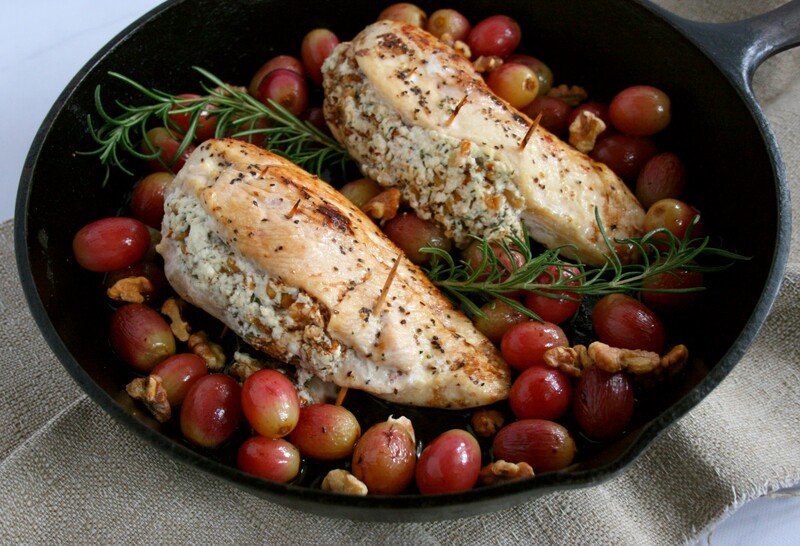 This Stuffed Chicken Breast with Grapes, Goat Cheese, and Walnuts recipe is sponsored by Welch’s Fresh®. All thoughts and opinions expressed are my own. Raise your hand if you’ve had one too many Christmas cookies this holiday season. I know I have. Christmas will be here before we know it and I’m already planning my post-holiday menu. I love the Christmas season so when it leaves, I have to plan yummy meals to look forward to. Maybe just a little more calorie friendly. My stuffed chicken recipe may look fancy and fussy, but don’t let it fool you. This one pan dish is beyond simple and there is practically no clean up. The star of this fabulous winter recipe is the Welch’s Fresh® Red Seedless Grapes. 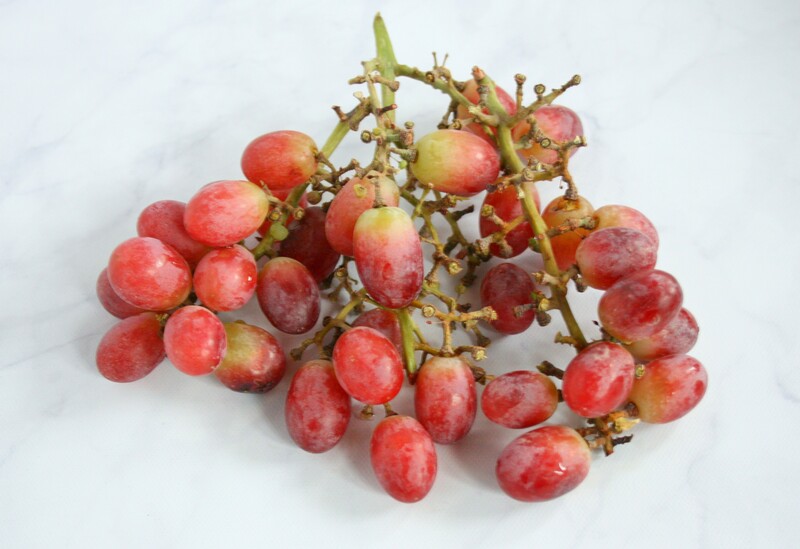 These crisp grapes are bursting with juicy sweetness. Which make them the perfect addition to this entrée. Have you ever tried a roasted grape? They are amazing and create a sweet sauce that pairs perfectly with the rosemary, walnut, and goat cheese stuffed chicken. Aside from their delicious flavor, grapes are a wonderful source of resveratrol a powerful antioxidant that may help prevent cancer and heart disease. Who can’t use a little extra health boost this time of the year? Preheat oven to 400°F. Mix goat cheese, rosemary, honey, garlic, and toasted walnuts in small bowl until well blended. Divide mixture into 2 equal portions. Carefully cut a deep slit along the meatiest side of the chicken breast to create a pocket. Be careful not to cut all the way through. Stuff the divided goat cheese mixture into each chicken breast. Stick two or three toothpicks through the open edges of the chicken to keep the stuffing from falling out. Season both sides of the chicken with sea salt and pepper. Heat 1 tsp of olive oil in a cast iron skillet. Add stuffed chicken and brown each side (about 2 minutes per side). 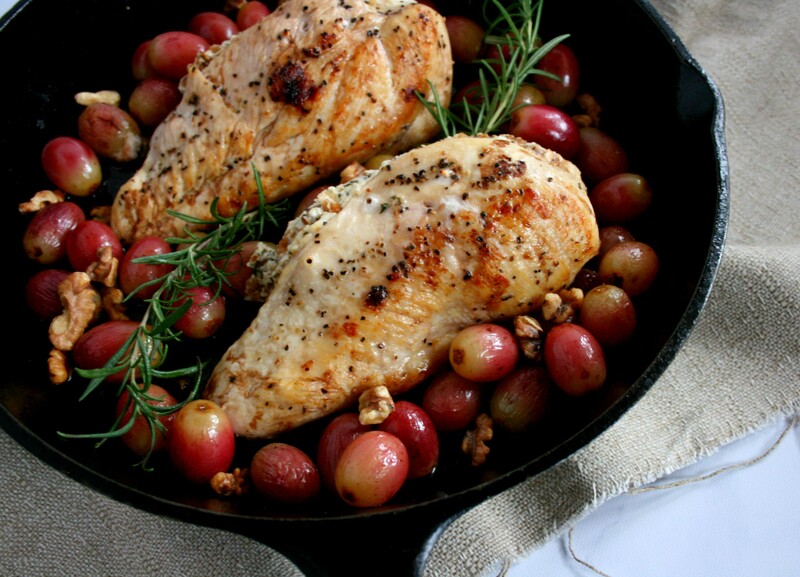 While the chicken is browning, toss 2 cups of grapes in 1 tsp olive oil and salt and pepper. Add 1 cup to the skillet once the chicken is browned. Place the chicken in the oven and bake for 15 minutes. Add 1 Tbsp balsamic vinegar to the remaining grape mixture. 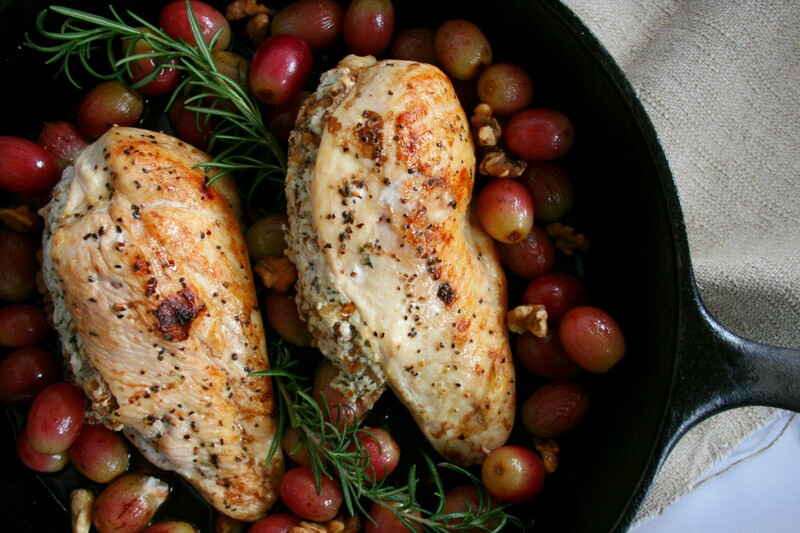 Remove the chicken from the oven and add the balsamic grape mixture. Bake for 5 minutes or until the chicken’s internal temperature reaches 165 degrees Fahrenheit. Garnish with rosemary.